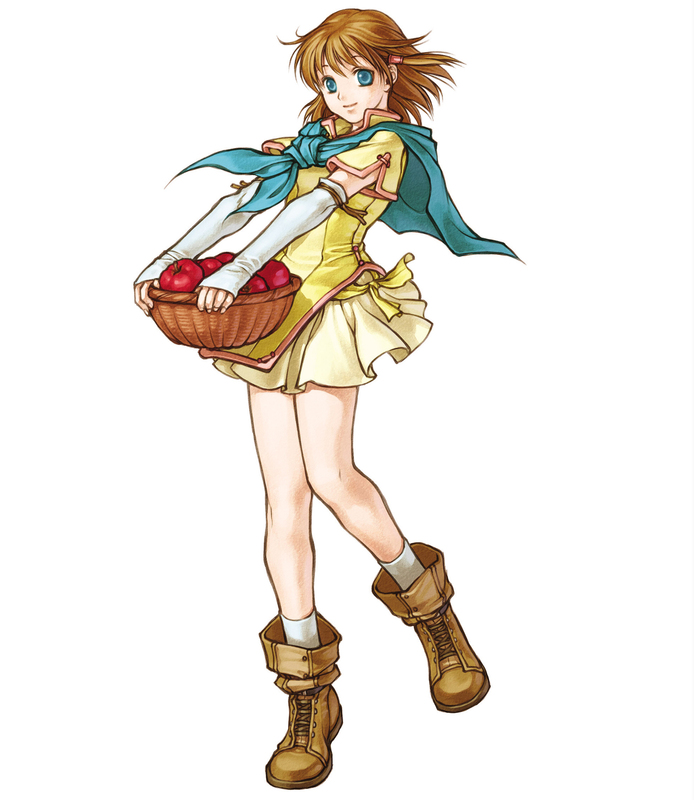 Mist is a young cleric in the Greil Mercenaries. 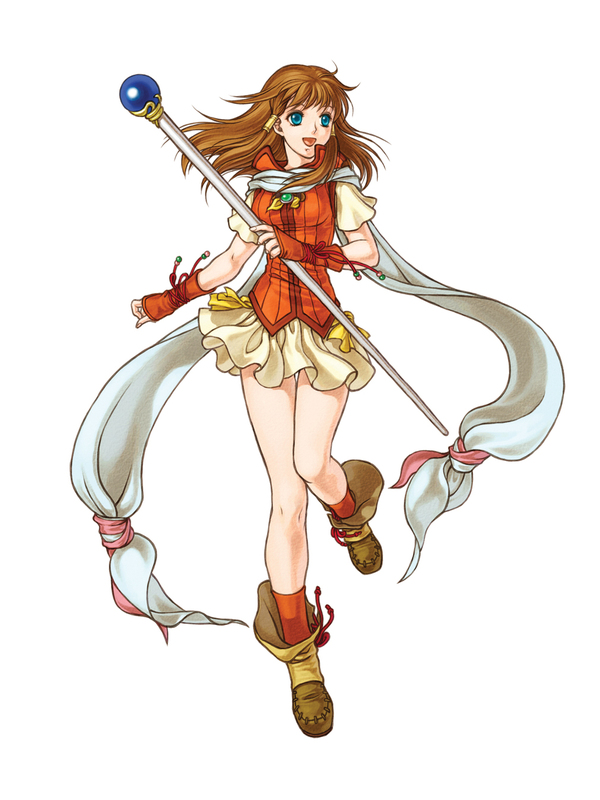 She is the daughter of Greil, the commander of the mercenary group, and younger sister of Ike, the main character of Path of Radiance and Radiant Dawn. She is quite caring towards the people around her, helping out as much as possible with the chores and work done around the fort. Mist is unique among the people of Tellius in that she possesses a large amount of order, one of the two driving forces of human nature. Apparently her mother, Elena, also had this trait. It was this trait that allowed Mist and Elena to safely hold Lehranís Medallion, also known as the Fire Emblem. The medallion exuded chaotic energies, which took the form of a mysterious blue light, because of the dark god imprisoned inside of it. These chaotic energies caused normal people who got in contact with them to give way to the chaotic side of their personality. However, in Mist and Elenaís case, the order in their personalities counteracted with the chaos, making the medallion's effects null. As such, they were some of the only people in Tellius who could hold the medallion safely. Because of this trait, Elena was entrusted with the medallion by Lillia, the Heron Princess of Serenes. And, likewise, the medallion was entrusted to Mist after Elenaís death. Mist holds on to this medallion and cherishes it as a sort of keepsake of her mother. Mist, like Ike, was born and raised for her early years in Gallia, until sometime after her motherís death. Since Mist was quite young at the time, she doesnít recall the events. After Elenaís death, Greil moved to Crimea and formed the Greil Mercenaries. Mist began to work in the base by helping out with the chores and the work, such as washing clothes and preparing meals. Her cooking becomes target of several jokes from other characters, particularly Ike, since apparently itís quite atrocious. However, she dutifully works on improving this skill. Early in Path of Radiance, Mist and Rolf get kidnapped by a group of bandits after the Greil Mercenaries stop them from looting a village. The bandits wanted to get revenge for their fallen comrades. Mist is shown to be quite courageous in this situation, since she remains quite calm and even comforts Rolf, assuring him that everything will be solved soon. Soon afterwards they are saved by the Mercenaries and all returns to normal. Soon after the invasion of Daein, the Mercenaries find Elincia, Princess of Crimea. Once it becomes evident that the Daein Army wants to finish off Elincia, they decide to move out to Gallia to seek for help from the Lion King Caineghis. It is at this moment that Elincia and Mist become friends, sharing stories of their lives. This is also when Mist shows Elincia her medallion, and both become quite intrigued by the mysterious blue light that radiates from it. After their encounter at Fort Meritenne, Greil and the Black Knight battle alone in the forest unbeknownst to anyone else. Greil is killed in this duel, which is a heavy blow to Mist. It is this event that influences her to join the mercenaries as a healer. She felt she had to; she couldnít forgive herself for not being with her father in his last moments. Apparently, she had managed to convince Rhys to teach her how to use staves in secret. From Gallia, the Mercenaries travel to the Begnion Empire to seek help from the Apostle. Sometime after Ike and the Mercenaries leave Begnion, Volke, an assassin-for-hire, reveals the secrets of Ike and Mist's parents and the medallion to Ike. It was revealed that Greil had murdered Elena after touching the medallion and losing control. Eventually, Mist was informed of this, and while she expressed sadness over her motherís death, she stated that she felt sadder for her father knowing that he had suffered every day because of this. Near the end of the war, when Ike goes alone to fight against the Black Knight to take revenge over his fatherís death, Mist goes to help him without his consent. She didnít want her brother to die without her by his side. After the war, she gives the medallion to the heron siblings, since she knows that they will be able to keep the dark god in control inside of the medallion. Mist was not seen along with her brother and the rest of the mercenary troop until the final stand between Queen Elincia and the rebel forces. While Ike and the majority of the company did battle with the rebel soldiers, Mist tended to Lucia as Rhys was healing her. After reuniting Lucia with her queen, Mist expressed relief and gladness to return home to the mercenary fort. Their stay was short-lived as her brother was approached to join the Laguz Alliance against the Begnion Empire. On the field of battle, Mist aided her fellow troops far more than she did in the Mad King's War, participating in every battle the mercenaries fought. Her staff and sword, Florete, became great assets to the war effort. As the tides of war swelled, chaos abounded, and the deity held in the medallion struggled against its confines, Mist was the only beorc to feel any effects. The chaos emitted from the medallion caused her to faint as it had done the herons. This was largely due to the amount of order Mist possessed. When the deity, now known as the goddess Yune, asked for aid in defeating her counterpart, Ashera, and saving Tellius from Ashera's wrath, Mist joined the group led by Ike on the trek to Begnion's capital. Mist was also one of the first Yune chose to speak with when the goddess first appeared. After Ashera and Yune departed from the world, Mist returned to the mercenary fort along with the rest of the company. It is unknown how she lived her life. Some say she lived happily alone, refusing the many suitors who came to court her. Others say she gave in to her feelings for one man, Boyd, and married him, crying, much to her husband's chagrin, when the vows were given.